During the California gold rush nearly two centuries ago, the first million was made not by a miner, but by a publicist and merchant who sold picks, shovels and other supplies to eager prospectors. The legalization of marijuana for adult recreational use in Colorado and Washington coupled with a growing base of states that adopted medical marijuana legislation has spurred a boom in the legal cannabis business. The budding industry is expected to tally $2.57 billion in sales this year, according to an ArcView Market Research report released late last year. One of the fastest growing areas for investment is the ancillary business segment, which consists of firms that do not handle the marijuana products, but provide services for those who do. “One of the reasons that the ancillary sector of the industry has drawn a lot of attention is because some investors feel more comfortable investing in a business that isn’t directly tied to the products,” said Taylor West, deputy director of the National Cannabis Industry Association, a Washington, D.C.-based trade group hosting the Cannabis Business Summit on Tuesday and Wednesday in Denver. Some say that activity could fuel the “Silicon Valley of weed” in Colorado’s capital and northern Front Range communities, establishing areas such as Denver, Boulder and Fort Collins as hubs of the burgeoning multibillion-dollar industry. Surna Inc. was founded with the aim of acquiring intellectual property, “disruptive technologies,” assets and scalable companies in the cannabis industry. In April, Surna announced the acquisition of Hydro Innovations LLC, a Boulder firm that launched its first product in 2007 and evolved into a producer of cooling systems for indoor gardens. Surna paid $500,000 — made up of cash and potential Surna stock options — for Hydro Innovation’s business, assets and intellectual property, according to a U.S. Securities and Exchange Commission filing. 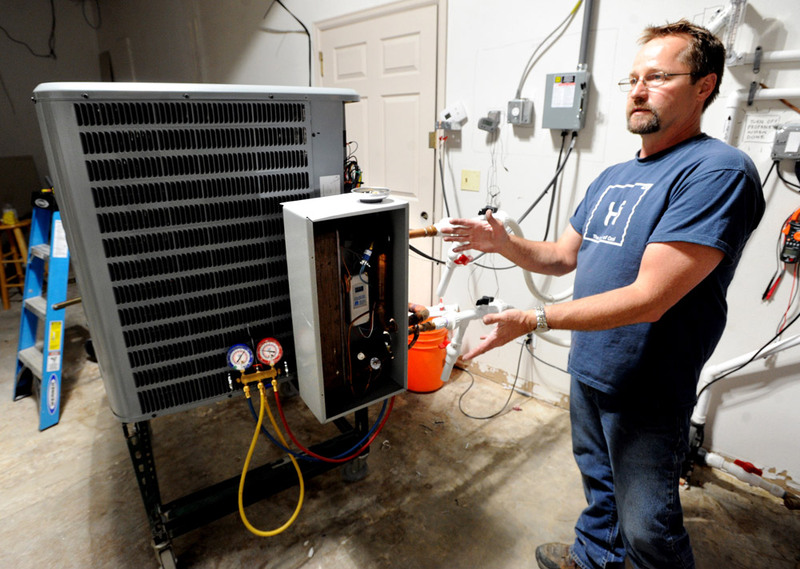 Brandon Masterson shows the condenser unit and chiller box that are part of Surna’s water-chilled cooling systems for marijuana grow operations on June 18, 2014. Within a few months’ time, Surna has grown to 20 employees from two people and has started filling out 18,000 square feet of industrial space off 55th Street in Boulder. The business that last year supplied cooling systems for grow houses ranging from 5,000 square feet to 20,000 square feet now is getting orders for operations in the 150,000-to-400,000-square-foot range, Bollich said. The company’s patented technology can maintain the moderate temperatures marijuana plants prefer. Just as some grower has the potential to hit the branding jackpot and create the “Coors Light”of weed, Surna is shooting to become the industry’s “GE,” he said, referencing the Fairfield, Connecticut-based multinational conglomerate with a $270 billion market capitalization. In Superior, a cannabis software startup has ambitious goals of its own: to capture the niche homegrower market. GrowBuddy is a web- and mobile-based journal that allows users to manage their grow operations. The software allows for the tracking of items such as waterings and nutrient schedules and incorporates analytics. The executive team of the five-person GrowBuddy compare the cannabis industry to that of the craft brewing business. As the laws change, more people are looking to grow their own marijuana plants and are turning to Internet forums to learn how to grow, said David Standard, GrowBuddy’s chief visionary officer. “With beer being readily accessible everywhere you go … there are still people that brew their own,” said Rob Rusher, GrowBuddy’s CEO. “It’s in the couple million of people in the U.S. who do that now. The majority of GrowBuddy’s customer base has come from Colorado, California and Canada. GrowBuddy’s software is in public beta and a paid application is in development, Standard said, adding that future upgrades could include the addition of a social network for growers. The firm has had promising discussions with investors after pitching at the inaugural Cannabis Capital Summit last month. “When we started, it was unheard of,” Standard said of the investor attention.